Well folks here in Arizona it’s pretty much almost Summer, but for the rest of the country you are anxiously awaiting Spring. Today I’m sharing this Pom Pom Spring Wreath to help you get your home ready for Spring. 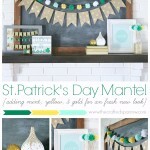 It’s bright and cheerful, and pretty easy to make. 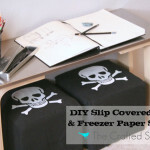 This post is also part of our monthly blog hop, and my blogging buddies have also put together some great ideas to get you ready for spring. So be sure to check them out below. 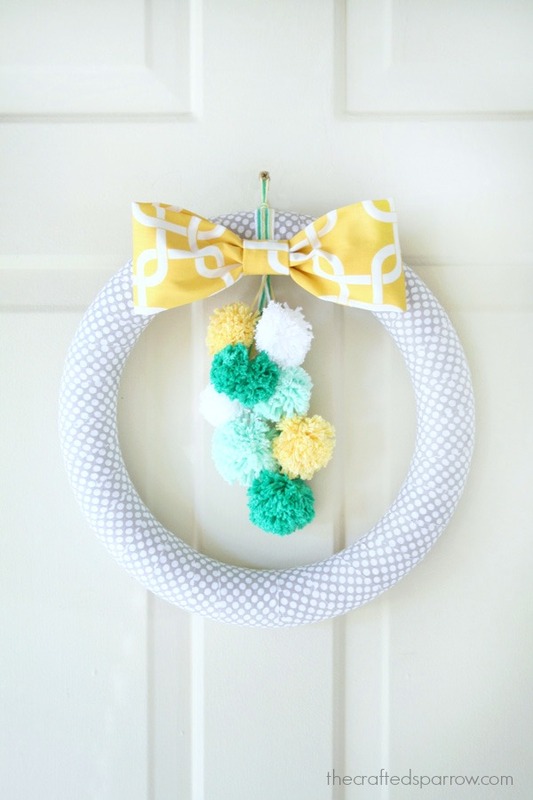 For now let’s get started on this cute wreath. 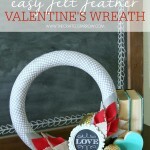 I actually re-purposed this Valentine’s Wreath I made over at SNAP last month. 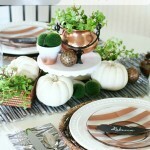 I have been using only pins on my wreaths lately so I can transition them from season to season easily. So you can check out my tutorial over at SNAP to see how to wrap your wreath form. 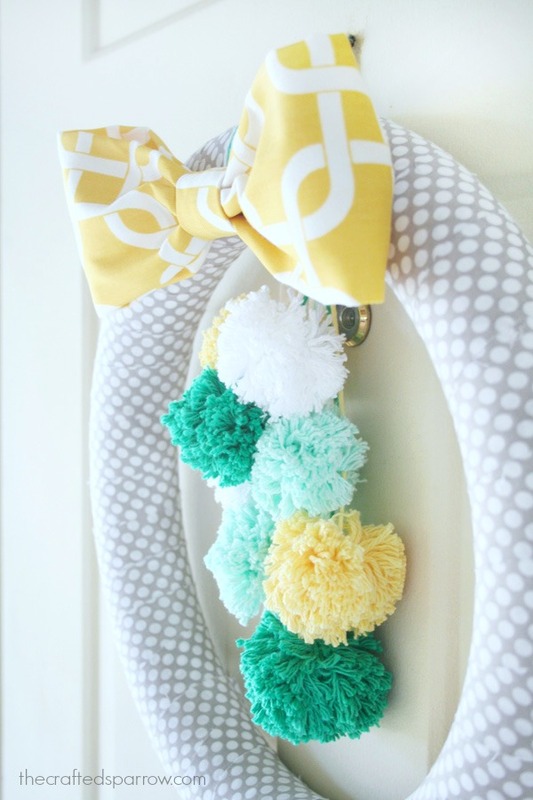 Next step is your pom poms. For these pom poms I wrapped the yarn around my fingers about 70 times, if you are making larger poms wrap it around 4 fingers and wrap the yarn around 90-100 times. 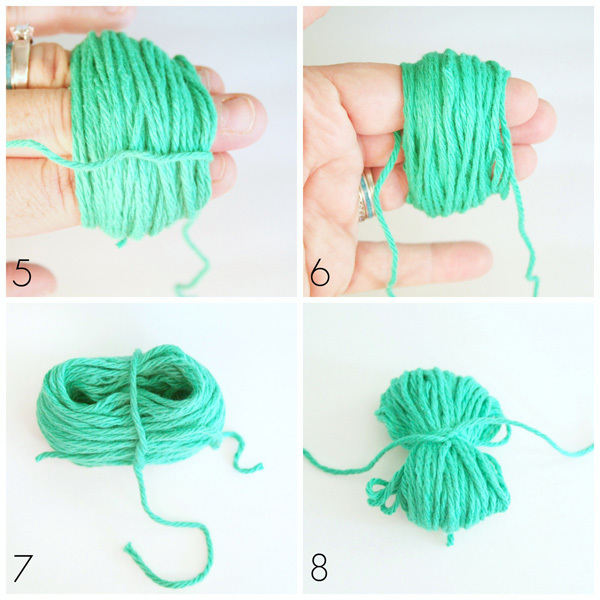 Once the yarn is wrapped around your fingers and you have slid the extra piece of yarn in between your pointer and middle finger (using a pair of scissors to help push it through is what I do, it’s not as scary as it sounds) tie it around the bunch of yarn one time. Carefully slide the entire bunch off your fingers and move the loop that is all the way around the bunch to the center before completely tightening it. Once it’s centered pull it tight and flip it over to tie it again on the other side, this time double knot it. 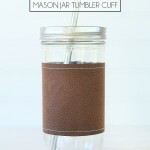 Be sure you have enough of yarn hanging from your knot, you will need this to hold on to later. Grab your scissors and cut all the loops. 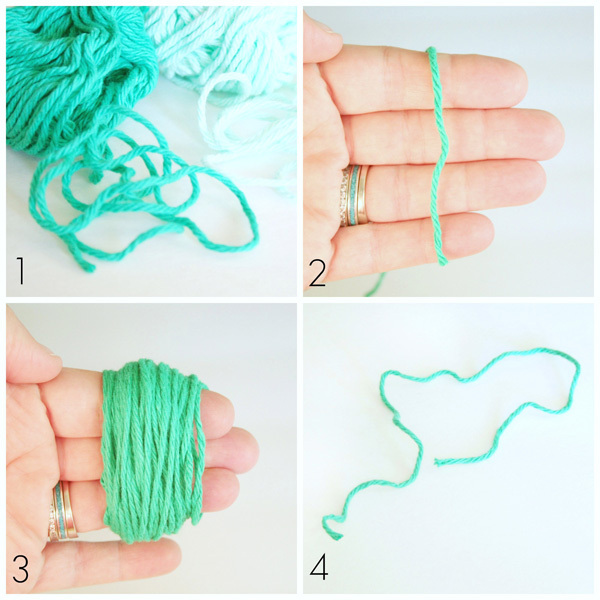 Once all the loops are cut you will hold on to the two longer pieces of yarn from your knot. Using your shears (shape ones make a difference) give your pom a hair cut and shape it into a ball. The shorter you go the fluffier it will be. The kind of yarn you choose will also determine the fluffiness of your pom. The kind I used wasn’t super fluffy so I have a pom that looks a little stringy. 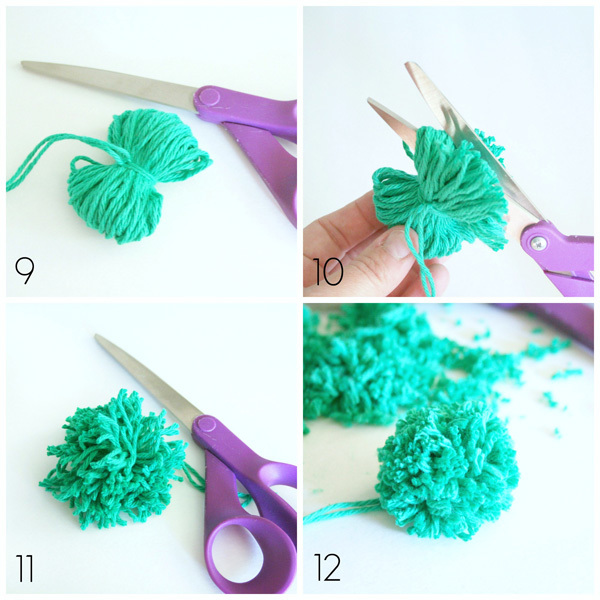 Once your done with your poms you can tie a longer piece of yarn to them and then tie them in a large bundle to your wreath. 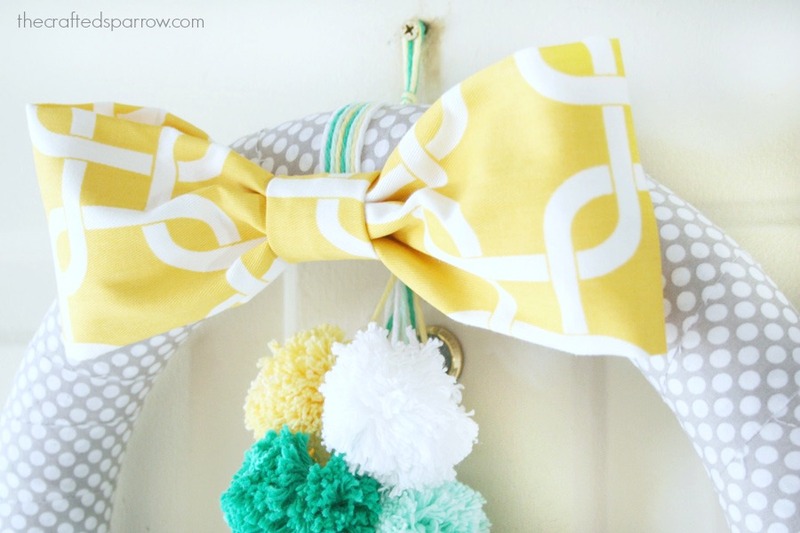 For the bow I used a piece of home decor fabric I had on hand. I only used my glue gun to make this one thing for this project. Cut a wide strip of fabric, mine was about 12 x 16″. Cut another small piece about 4 x 4″ for the center of your bow, set aside. Fold your larger piece of fabric over in half lengthwise once, and then fold over the other side and apply a small bead of glue. Fold over each end and glue the ends together. Pinch your bow in the middle and use the small piece of fabric that you set aside and wrap that around the bow and glue at the back. I then just pinned my bow on to my wreath. That’s it, your done. 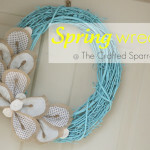 Cute Spring wreath all ready to welcome guests and give your front door a cheerful makeover. 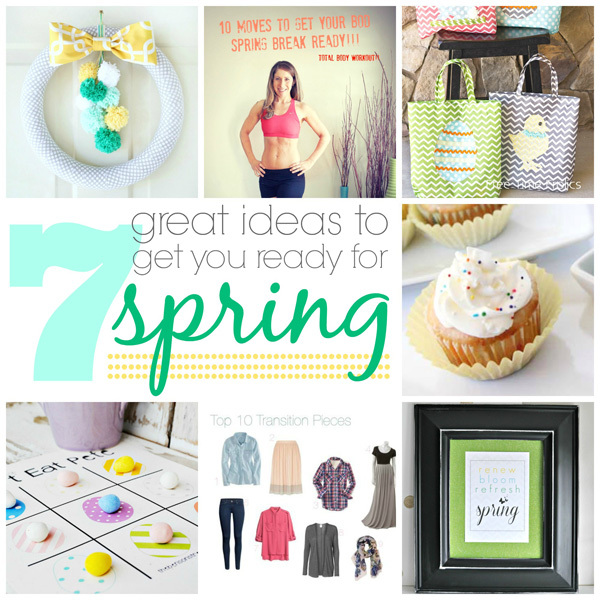 Don’t forget to check out the other great ideas to get you ready for Spring from my blogging buddies.